Shop SE Electronics Reflexion Filter Pro Ambience Control from AMS with 0% Interest Payment Plans and Free Shipping. The SE Electronics Reflexion Filter is a great way to take out problem ambience with out all the expense of acoustically treating a room. The Reflexion Filter envelopes the rear of the microphone to produce a smooth, drier sound and reject unwanted reflections. Plus the RF PRO mounting hardware has been updated to a more durable, stable and easier to assemble design. 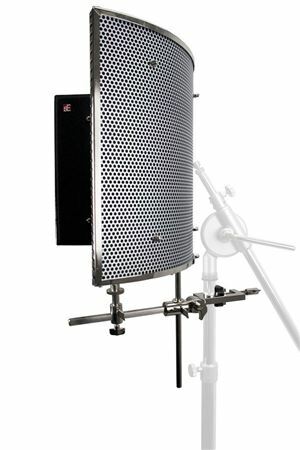 The Reflexion Filter is perfect for a home studio with out acoustic treatment or a performer that also has to operate the recording device. The Reflexion Filter also works very well on an instrument that requires a dry, accurate sound. An included variable position, stand clamp assembly allows you to attach the Reflexion Filter to any standard microphone stand. The various layers both absorb and diffuse the sound waves hitting them, so progressively less of the original source acoustic energy passes through each layer. This reduces the amount of energy hitting un-treated walls and other surfaces so there is less of the original source reflected back as unwanted room ambience to the mic. The Reflexion Filter also helps prevent any reflected sound reaching the back and sides of the mic. Its shape and size have been carefully tested to maximize absorption while keeping coloration down to only around 1dB, and leaving the microphone’s polar pattern unaffected. If you own a microphone you need one of these! The SE Reflexion Filter is portable. It's innovative. It's versatile. It uses state of the art materials. 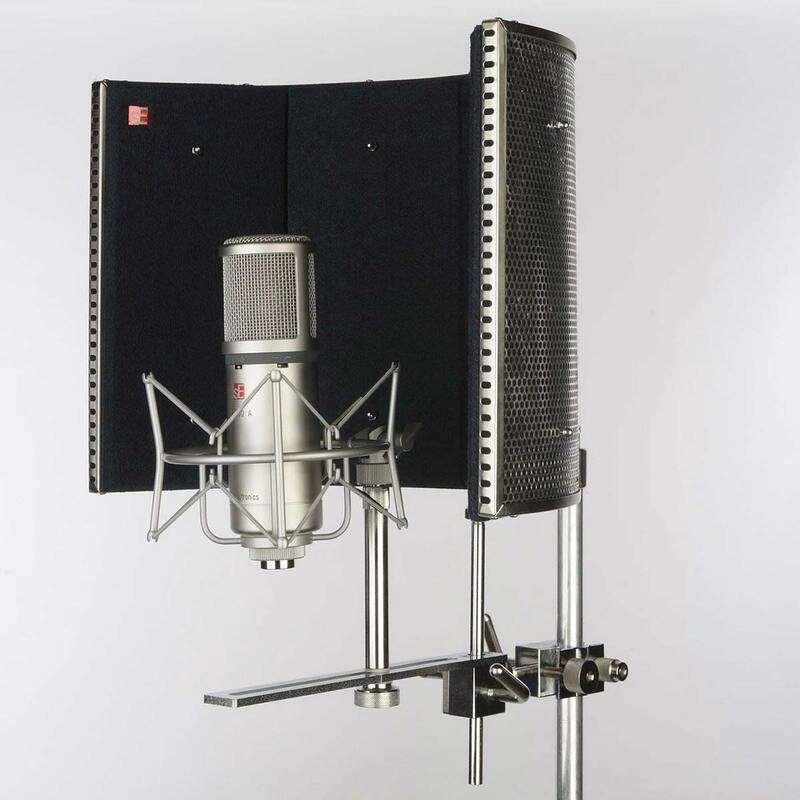 It works, and it’s a fraction of the price of acoustically treating your studio environment! With this filter you can bring acoustic treatment with you wherever you need it and improve your recordings. Four formed panels of state-of-the-art specialist acoustic absorptive material separated from the main unit via a small air gap. The Reflexion Filter's shape and size have been carefully tested to maximize absorption while keeping coloration down to only around 1dB, and leaving the microphone’s polar pattern unaffected. The stand setup attaches to any microphone stand via a clamp fitting, with additional assembly allowing the microphone (in its shock mount) to be moved both vertically and horizontally along the bar, and the Reflexion Filter itself can be moved vertically to tune for the optimum desired absorption performance. It weighs in at 8 lbs. The dimensions of the filter section are: 14.5 inches across to the outside edges, 12 inches high and 8 inches deep. The mounting mechanism extends down another 8 inches max, and is 16 inches across in the widest positional setting. makes a big difference when you records vocals!! im a happy customer! Feels & looks like quality workmanship. Solid construction, easy to attach to mic stand, and works exactly as advertised. For my small studio, it's perfect. Pretty straightforward assembly. If you have a cheap/light mic stand though, invest in a weighted one before you make this purchase. This bad boy is heavy and you don't want to risk damaging it by having your mic stand fall over. The setup was the hardest although it did not require any rocket science! This product will hold up for a very long time. It feels sturdy, and it will be a vital part of my home studio for years to come. The Acoustic features instantly provides great sound recordings. Set-up was easy and quick. Deadens the sound around the mic. I love it! It does improved the microphone sound. very easy to assemble, just make sure you use a DR mic. stand w/c is the best stand for this item. It does improved your mic. sound & some how reduce the feedback. It is extremely well made. The hardware is a bit heavy though. I had alot of problems keeping it from tipping over my mic stand. I knocks alot of outside ambience from surrounding the mic. Very simple to use, once you set it up. It actually deflects ambience so you get PURWE vocals from your mic. I run it with my RODE NTK tube mic. Sweeeeeeeeeeeeet!